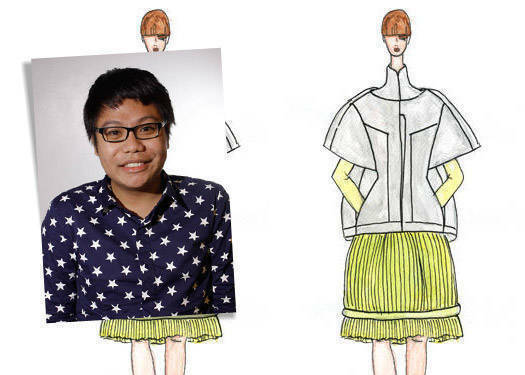 The Cebuano designer as a finalist in a Singaporean design competition. Last year, Singapore's Asia Fashion Exchange (AFX) embarked on its third year. AFX is a platform that supports four key departments of the fashion industry, with four big events to encompass each: the Blueprint trade show for trade, Audi Star Creation for talent development, Asia Fashion Summit for business conferencing, and the Audi Fashion Festival Singapore for the consumer. Overall, AFX is Singapore's bid to become the fashion hub of Asia. But let's focus on Audi Star Creation, which uncovers emerging design talents. Cebuano designer Mike Yapching quietly nabbed a finalist slot in the 2011 competition—the only Filipino designer to do so. Upon his mentor Edwin Ao's encouragement, he submitted a portfolio for a collection titled Spiral in Motion. "[Edwin] had participated in a design competition in Singapore several years ago and it really helped jumpstart his career, despite the fact that he did not win," Mike says. "But he convinced me to send in a submission and that unless I went for it, I would never know how good I really was." Spiral in Motion represents the concept of bayanihan in Filipino, as well as "the coming together of Asia as a community, [and] the cyclical nature of life." Pleated jusi and silk cocoon in varying shades of blue dominate the lovely collection, which is quite geometric in its abundance of graceful curves and lines. "The collection is full of lines. I like lines because from a single one, I think one can create a more complex idea, an idea that is constantly evolving," Mike explains. While he did not win the first prize for Star Creations (prizes include S$10,000 and a one-year internship with FJ Benjamin of Singaporean brand Raoul), he still took away a lot from the experience. "I had a blast when I was in Singapore!" Mike recounts. "The eight days I stayed there were the best eight days of my life. You wouldn't feel that there is a competition going on because all the finalists were friendly and easy to be with. One can openly ask questions about each others' collections so it's also a learning process for me and for everyone. We got to attend seminars, watch shows, and meet big people in the industry." For the 2013 competition, Star Creation will accept submissions in October or November of this year. We'll keep you updated as we receive more information. Meanwhile, Mike advises this to aspiring participants: "Impress the judges not only through your clothes, but through your personality as well. It also helps if you entertain the media." Click on the next page to know more about Mike Yapching. To see his Spiral in Motion collection, click on the photo gallery. Click here for Mike Yapching's Designer Directory.